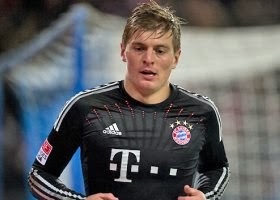 Premier League clubs are circling Bayern Munich for contract rebel Toni Kroos. The Daily Mail revealed that Bayern bosses are digging in their heels over Kroos’ bold bid to more than double his earnings from just over £60,000 a week to around £150,000 and have bluntly told him talks over a new deal will remain on hold until he lowers his sights. Manchester United manager David Moyes had been first to react to growing uncertainty over Kroos’ future by watching Bayern’s game at Borussia Monchengladbach with the 24-year old’s agent. Should there still be no thaw in relations at the end of the season, it seems certain Manchester City, Chelsea, Arsenal and even Liverpool will declare their hand and make it clear to Kroos they are prepared to meet his wage demands.